This is a post about something obvious. We all know it. But we pretend we don’t. Human Development is trashing the only home we have. Something is deeply wrong with our model of development. But we still use it. Here’s a view from a different angle of the big thing crashing about in development’s living room. 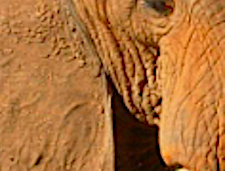 Another view of the elephant. Conclusion to WWF’s Living Planet Report. If anyone could deliver this message in its full urgency, it would surely be a naturalist and global name in environment like David Attenborough. George Monbiot writes this acerbic critique of the much revered Attenborough and the BBC. Monbiot keeps shouting “Look at the elephant”, Attenborough says the rich world’s safari is so much more fun if we look at beautiful animals on the other side of the jeep.. The debate says much about who we are and what we value. To follow it you might want to start here. WWF’s Living Planet Report is a serial scientific assessment of our planet’s health produced every two years. The November 2018 edition was shocking. Here’s one graphic, showing a variety of social indicators on the left and environmental indicators on the right. It is inescapable - unless you deliberately look away- that there is an almost exact parallel between the hyperbolic rise in human social indicators and risks to the biosphere. An exact match between Socio-economic trends (development) and planetary risks- I.e. Development trashing the planet in pictures. Several other graphics which show exactly the same thing. In the one below- risks to soil biodiversity (critical for ecosystem- and human- health)almost exactly match where people live and food is produced. A valid conclusion is that humans are bad for human health and the world’s. And here we see human consumption exactly matches the current definition of human development. What is commonly understood as the developed world consumes most, the rest is trying to catch up, even while we know it is unsustainable. WWF’s biodiversity Index shows not the slightest inflection after each global conference. “Highly Developed” and “resource over-users” have the same meaning at present. Can this change? The report finishes with a graph of its biodiversity index over time. It shows a mind numbing 60% loss over the last half century. WWF tries to be positive by projecting alternative trajectories for different models. 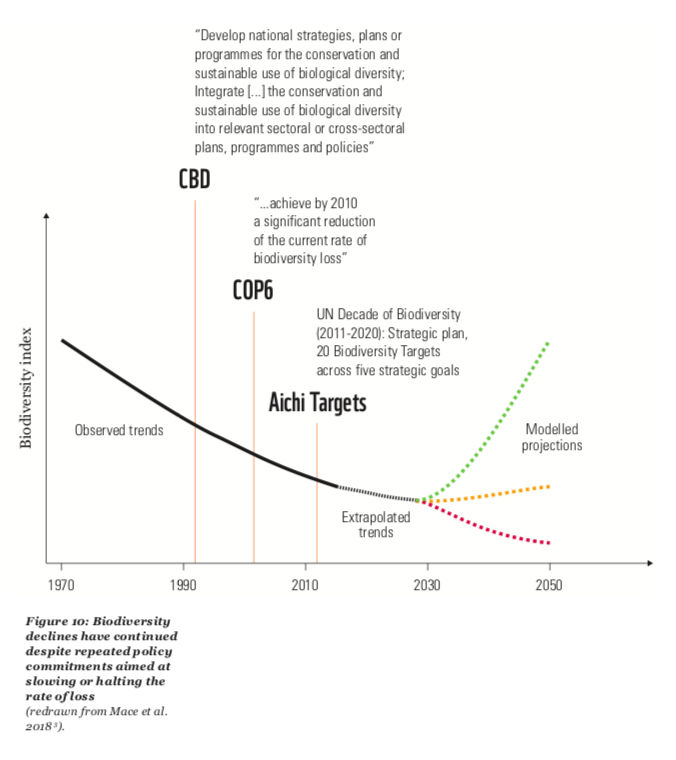 They hold up the 2020 summit on biodiversity as a key moment in our future when the graph could turn upwards. Yet the smooth hyperbolic decline shows not the slightest inflection in response to various biodiversity conferences in the past and WWF gives no reason why the 2020 conference will be any different. Hmmmm. I think WWF is right when they conclude “We need to radically escalate the political relevance of nature and galvanise a cohesive movement across state and non-state actors….”. Decisions made in conferences where conservationists rationally assess scientific information won’t save the planet. Conservation is implemented by governments, private companies, farmers, consumers, individuals, NGOs, INGOs… all of us as we live our ordinary lives, express our values and aspirations, follow our development pathways. Conservation is not about biology. It is a social science, a development question. It is solved in economic and political spheres, not scientific conferences, and solutions are implemented in the name of development. Thats the space the elephant is crashing around in. Our space. The graphic below from the Living Planet report shows how WWF sees it- human life predicated on a healthy planet and economic factors as but a tiny pat of that. Development simply overturns this. Most projects are predicated on improving economic conditions, try (or don’t try) to fit social dimensions around that and the environment if it is considered at all is a tiny add-on at the end. (WWF points out ecosystem goods and services are estimated to be worth a “tiny” US$ 125 trillion/year). This depressing story is how it is, but is it how it has to be? No, but we have to re-define “development”. Terms like ecosystem health, biodiversity, climate stability, ecological goods and services would feature. On the human side equality, justice and well-being would be much more prominent than “GDP”, “Economy” and “growth”. WWF might be more important than the World Bank. All of us in development urgently need to turn over our approach, the values we bring, the methods and tools we use. Funders, practitioners, planners, commissioners, evaluators, governments would define development as only those interventions which improve the environment. This should apply equally to a tiny income generation project in a Himalayan village, a trillion dollar World Bank funded hydro dam in Latin America or a huge government funded transport scheme in Britain. Development should live more on the right side of the first graphic (ecosystem trends) and much less on the left (social and economic trends). The Panda Rampant would upstage the Dollar Rampant. Earlier I said conservation is a social science. Now I say development is a ecological question. This is a radical and urgent redefinition of ourselves as enmeshed in interdependent feedback loops between humans and environment. This is all obvious (elephants in living rooms are) but is it possible?. Within a few years? If not what is humanity’s future? What do you think- Does the environmental crisis really overturn nearly all of what we think about development and how we do it? Comments please.